After weeks and months of preparation, the big day was finally here! 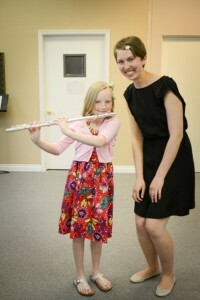 My flute students and I were geared up and ready to give our spring studio flute recital. Giving a recital was a great way to showcase our growth as flutists and prove to everyone how much our hard work could pay off. While most of my students started with me near the beginning of the school year, not everyone had 8 months or more of lessons under their belt. Some, like Dylan, had only been playing the flute for 3 months! The variety of levels made the recital that much more interesting, though, and it was great to see everyone perform successfully at their skill level. Together we chose great repertoire, learned lots of notes and rhythms, expressed ourselves musically, and, for some, even played with piano. Most of my students had never played with piano before, so this was a new and exciting challenge for them, pushing their musicality and teamwork skills. Finding a good performance tempo in the moment – staying calm, not everything is run on adrenaline. Be cool as a cucumber. Positive self-talk – You ARE ready. You ARE prepared. You ARE a BEAST. Enjoying the moment! The past is in the past… so don’t worry about it! Hakuna Matata! On the day of the recital, the energy level was super high, and I could tell everyone was getting excited for his or her solo and/or duet. We held some last minute rehearsals to calm the nerves and really feel secure on our pieces. 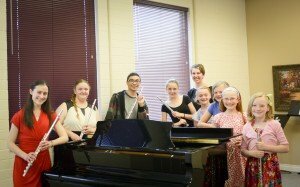 Our pianist, Sean, was as encouraging and positive as ever, and he provided a great foundation for our pieces. We could not have done it without him – a huge thanks to him!! Right before the concert, we had a little pow-wow away from everyone else to go through the order of things, give last minute reminders, and have a “pump-it-up!” pep talk. The clock struck 3:30pm, and we took the stage. Our full audience included friends, parents, siblings, grandparents, and even out-of-town extended family. I could not have been happier with the turnout! The recital itself went by really fast, and, of course, there were a few hiccups here and there. But we recovered right away and made the best of everything—because when life gives you lemons… You fill in the rest 🙂 To say the least, we were all rock stars. Ellie and Sean took us on a journey with Luna and her flute on a train – talk about some cool pitch bend train whistles! Jesse went all punk on us and showed us things we’ve never seen before – who knew you could beatbox, bounce, play flute with one hand, and solve a Rubik’s cube with the other – at the same time?? All in all, it was a great recital, and I couldn’t be more proud of my students. They worked really hard—especially the two weeks prior to the performance—and I think my audience would agree that they heard some seriously awesome flute music. Of course, a big thank you goes out to the people who helped me make the recital happen – I could not have done it without them. All of the friends and family of students who played in the recital – you brought them to lessons, listened to them practice, and dealt with anything that arose in the process of preparing for a performance. I appreciate you, and I know your flutists do, too! Here is a video I put together with highlights and snippets from the recital – enjoy!